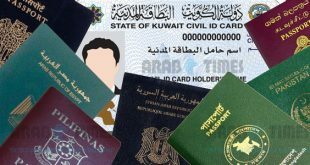 KUWAIT CITY, April 26: The Public Authority for Civil Information (PACI) will cancel the civil identification cards of thousands of unmarried expatriates who reside in private and model residential areas, in a bid to strictly implement the Cabinet’s directives in this regard due to the security and social problems caused by such a phenomenon, reports Al-Rai daily. 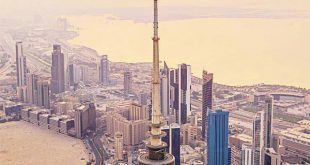 PACI Director Mosaed Al-Asousi confirmed the authority started to mark buildings where unmarried expatriates are residing after determining the model and private houses in different areas. 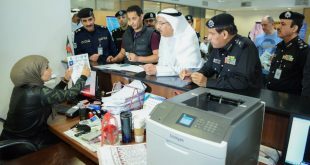 He explained the initial step will be to block the civil identification cards of unmarried expatriates found to be residing in the aforementioned areas as a preliminary step towards the non-renewal and cancellation of these cards if the holders do not transfer to the appropriate areas. He then urged the concerned unmarried expatriates to rectify their positions and vacate the private and model houses and asked the owners of these structures to stop renting them out to unmarried expatriates in order to avoid legal problems. Meanwhile, in its meeting Sunday, the Cabinet listened to the recommendations of the Public Services Committee on the issue. It also discussed the actions taken by PACI and praised the latter’s efforts in addressing the problem. Furthermore, the Cabinet tackled the recommendations of the Legal Affairs Committee regarding Law Number 42/1978 which stipulates granting financial support to sports clubs annually. The committee pointed out that the amount of financial support is determined as per the regulations of the Public Authority for Sports. The Cabinet approved the recommendations and forwarded them to His Highness the Amir Sheikh Sabah Al-Ahmad Al-Jaber Al-Sabah as an initial step towards referral to the National Assembly.